We want to make things as easy as possible for you – including getting answers to your questions. Below are some general questions we’ve been asked in the past that you may find helpful. However, if you’ve been the victim of a dog attack and want to know more about your rights, call us for a free legal consultation. 1. What should I do if I’ve been bitten or attacked by someone’s dog? You should seek immediate medical attention. You or your loved one may be in shock after such an attack, and you need a medical opinion on the severity of your injury. Dog bites pose a serious risk for infection and scarring, and a physician should be contacted immediately for treatment. If you or a loved one are in immediate medical distress, call an ambulance or go to an emergency room as quickly as possible. Identify the Dog that bit you. You should try to write down a description of the dog and all of the contact information of the dog owner, including their name, address, and telephone number. Identify witnesses. Get the names and contact information for any witnesses to the dog bite incident. Identify the location: Be sure to take note of exactly where the dog bite occurred. If possible, take pictures of the dog itself and the location of the incident. Take photos of the dog bite injuries. As soon as practical, take photographs of all visible injuries and any torn or bloody clothing. Additionally, if possible, take pictures of the dog itself and the location of the incident. Any and all information that you collect may be helpful for your dog bite case. The more information you provide the easier and quicker a dog bite attorney can evaluate your case. Report the dog bite incident to Animal Control as soon as possible. 2. Who is responsible if a dog bites someone? California Civil Code Section 3342(a) states that the owner of a dog is liable for the damages suffered by anyone bitten by that dog while in a public place or lawfully in a private place regardless of any prior knowledge of the dog’s viciousness. 3. Am I guaranteed compensation if I have been bitten or attacked by a dog? In life and in lawsuits, there are no guarantees. If liability can be established and proven against the owner of the dog, then they are liable to compensate you for your physical and mental pain and suffering, loss of income, and medical expenses related to the injury. Dog bite victims are entitled to compensation for medical bills, lost wages, and other personal items damaged because of the dog attack. A dog bite victim may also receive compensation for the pain and suffering associated with the dog attack. An experienced dog bite lawyer will be able to discuss your options after complete evaluation of your case. 4. The dog’s owner wants to talk to me about my injuries – what should I do? You should only exchange contact information with the owner and get the dog’s license number. Don’t sign anything the owner gives you or write anything to them. Speak with an attorney first for some advice. 5. The dog’s owner insurance company wants to talk to me about my injuries – what should I tell them? We recommend that you not discuss your injuries or medical treatment with anyone except an experienced dog bite injury attorney. We recommend that you not do not give any statements to an insurance adjuster or insurance agent and do not sign any document without discussing it with your legal team first! The insurance company’s agenda is protecting themselves from paying out what they consider to be expensive claims, even when the claim is valid. They are not in the business of taking care of you. The information you give them can and will be used against you to defeat or minimize your claim. Also, do not let them talk you into settling the case yourself. You may have a right to certain types of compensation for damages you may not know exist. A dog bite claim is usually handled by an insurance company, not a friend or relative. In California, dog bite victims are entitled to be compensated for their injuries even if the dog is owned by a friend or relative. 7. How long does a dog bite case typically take to win? Not all dog bite claims are the same and therefore take different amounts of time to be settled. If a case goes to court before a jury, it can take additional time before it is resolved. The more severe your injuries are, along with other aspects of the dog bite case, the more likely it will take longer to resolve. That is why it is important to contact a dog attack injury attorney immediately so that you can begin your dog bite claim while receiving treatment for your dog bit injuries. 8. What does “strict liability” mean? California is a statutory strict liability state. This means that the owner of the dog will be held responsible for any injury, regardless of whether the animal has previously shown aggressive tendencies. California Civil Code Section 3342(a) states that the owner of a dog is liable for the damages suffered by anyone bitten by that dog while in a public place or lawfully in a private place regardless of any prior knowledge of the dog’s viciousness. 9. Can I receive compensation if the dog attack didn’t result in a physical injury but I suffered a mental or psychological injury? Yes, however you would need to seek medical attention for your psychological injuries just as you would for physical injuries. 10. Do I have to prove that the dog that bit me was dangerous? In some cases, it can be extremely difficult to prove that the dog was previously known to be dangerous. The best thing you can do is try to gather as much information about the dog as possible and give this information to your dog bite injury attorney to assess. California is a statutory strict liability state. This means that the owner of the dogs’ will be held responsible for any injury, regardless of whether the animal has previously shown aggressive tendencies. 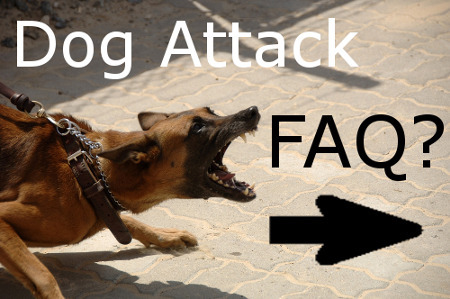 11. Who is most likely to be a victim of a dog attack? If you have more questions about dog bites, contact Yochelson & Assoc.